Why is iTunes so bad at media management? Apple’s iTunes is one of the most widespread and well-known pieces of media software in the world. It is installed on every Mac computer and, with the spread of iOS devices, has found its way on to more and more Windows computers as well. It houses the most successful digital music store and is the focal point for media across all Apple devices. Why then is iTunes so bad at managing media? I recently ripped my film collection from DVD and Blu-Ray. My plan was to store the video files (MP4) on a networked Apple Time Capsule, host the library in iTunes, and stream the films to an Apple TV connected to the living room TV. This should all have been easy. The Time Capsule (functioning as storage and network router), the Macbook Pro, the iTunes software and the Apple TV – everything was in the Apple ecosystem, and in the Apple ecosystem stuff just works…right? Well, most of the time, but not very well in this case. And the problem is iTunes. Let’s start with the fundamental architecture of this system. Apple eschews the common DLNA protocol, which could enable the Apple TV to stream media directly from DLNA compatible network storage. In Apple’s world, to stream video files from network storage to an Apple TV or iOS device, you need a computer running iTunes to mediate the media stream. In this design, iTunes is not just managing the library, it is actually receiving the media stream from the network storage and retransmitting the media stream to the Apple TV. This is inefficient for three reasons. You need to have a computer running, using power the whole time. It introduces an extra point of failure. It consumes three times the network bandwidth of a direct media stream between the network storage and playback device. 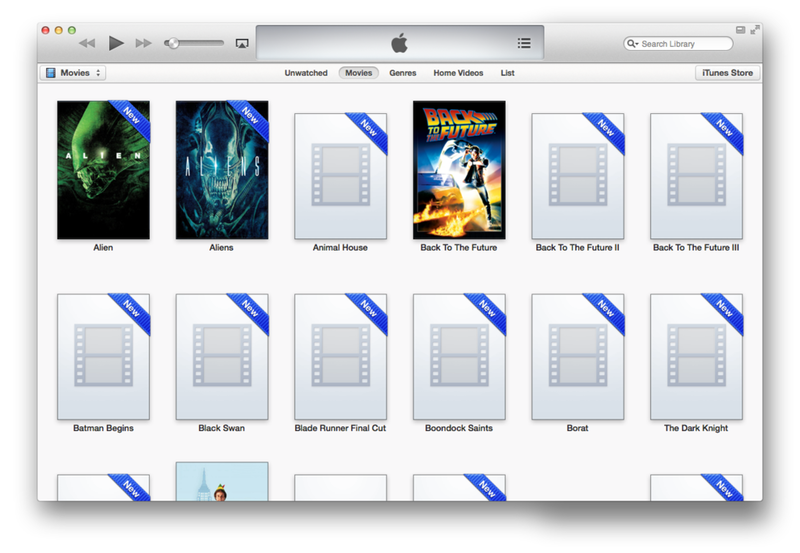 But the real frustration began when I started to import my ripped and converted films into my iTunes library. Apparently, iTunes thinks all media is basically music. Look at the available metadata for movies in iTunes and you will see fields for Artist, Composer and Album, but none for Cast or Director. It forces you to mentally map fields designed for music on to the fields you wish were there for movies. Also annoying is the fact that iTunes does not do tagging. This means you can only list one actor (I put this in the Artist field) and select one Genre, where you might reasonable want to list all of the significant cast members and tag a film with multiple Genres. Worst of all, though, is that iTunes will not populate any of this metadata automatically. Neither will it download and apply cover art automatically. You have to do it all for yourself, which can take hours for a large media collection. It’s when you start to realize how much of your time iTunes is going to demand that you sacrifice that you feel another surge of frustration. Because iTunes is slow. Everything moves like it’s wading through digital molasses. And this isn’t a Windows PC thing. I am running the latest iTunes on a powerful Macbook Pro 15 with a Core i7 processor and iTunes consistently takes forever to open the Get Info dialog box (which you’ll have to do for each and every film if you want to add metadata and cover art). When you’ve resigned yourself to the inefficiencies of the system architecture and wasted hours of your life building your library with metadata and cover art, you might expect the frustration to be done with. At this point, it should just start to work. And it does, sometimes. But here’s something else that iTunes is terrible at: maintaining stability of its media database. First of all, don’t let iTunes manage your media files. Go straight into your options panel and disable that right away. I didn’t. I naively assumed that iTunes would put stuff in the right place and keep it there. Unfortunately, iTunes has a bit of a mind of its own when it comes to this kind of thing. Halfway through the process of adding media to my library, iTunes got confused about something and decided that the best option was just to delete about 15GB worth of my video files. They were gone. I had to re-encode them and add them again to my library. I then promptly disabled iTunes’s media management. Second of all, iTunes seems to be very fussy about its connection to media files on network storage, even on an Apple Time Capsule. Sometimes, the Apple TV will lose its connection to the host iTunes for no apparent reason – I can only assume there’s a network timeout in the system somewhere. When this happens, restarting iTunes usually fixes it. Sometimes, when you restart your computer running iTunes, or disconnect from the network and then reconnect, iTunes will suddenly forget where all of those media files were stored, even when you have mapped the network folder on to your computer. You can show it where to find the files again, but it usually leaves all the metadata in a corrupt state, and then you have to go through it all again, manually, one-at-a-time, fixing things like missing cover art. So iTunes is pretty well broken when it comes to network media streaming, even when you live entirely in Apple’s world. But why is iTunes so bad at media management? Probably because Apple doesn’t want people to use it for media management. And they don’t want people to store their media files on network storage, even if it’s an Apple Time Capsule. And they don’t want people to stream local media on to an Apple TV. Why wouldn’t they want people to do this? Because I’m sure they would much rather people buy and rent content directly from the iTunes store and stream it from Apple’s servers. This means no local media management and no streaming over an home network. If you do things this way, maybe everything would “just work” as it’s supposed to, but at £4.49 for rentals it’s going to cost you. Apple, we all know you must be doing something new with Apple TV, so here’s a request. Please, for the love of all that is good, allow Apple TV to function as an iTunes client and allow direct media streaming from network storage (even if it’s only an Apple Time Capsule).